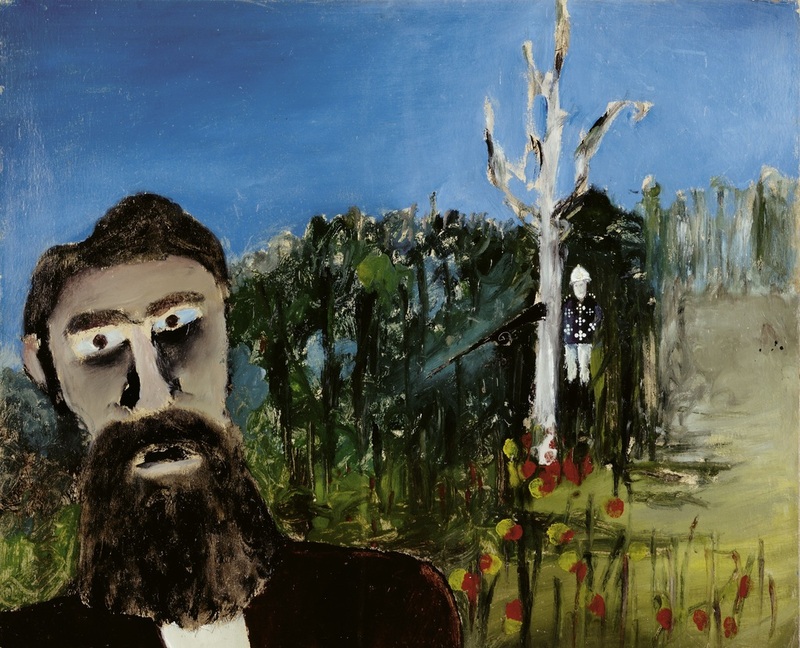 This is the only painting in the Foundation Collection that features Ned Kelly without his iconic helmet. From the bottom right corner of the picture plane Kelly emerges, his eyes sunken and his mouth open as if he is surprised or shocked. In the distance is the figure of Constable Scanlon who was shot dead at Stringybark Creek by the Kelly gang. He appears white faced, like a ghost in the landscape, against a dead white tree. Although Scanlon’s rifle is directed towards Kelly, its trigger is reversed rendering it useless. The sky looms large, pressing down on Kelly whose eyes reflect the blueness of the sky as he stares out at the viewer contemplating his fate.